Paul being a photographer from a very young age and I always playing with a camera especially when my children were born has grown into our wonderful business that we love. There are many reasons Paul loves photography. One reason being brought up with a dark room in his very own home learning on his own, and being critiqued by his father. His father said if you can do better than me "prove it" ! That is what Paul set out to do. He took criticism from his dad and to this day continues to study his craft. He studies in a different way now and that is with me his partner in every part of his world. We shoot together, wake up together, laugh, and love together. We have been together for 5 years and started out the business as portrait photographers. Paul said we would NEVER do weddings. Well look at us today. We are one of many successful wedding photographers in Las Vegas and have extended our photography to destinations. We are now starting to specialize in fashion and pin-up photography as well. Here is some of our latest engagements,weddings, and fashion photography. 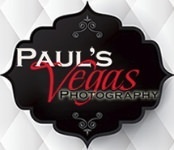 Paul and I will capture moments in Las Vegas or where ever you want, that will last you a lifetime. We strive to make you relax and enjoy your time with us so that we can get the best images of you. Call us for your engagement, wedding, corporate event, or portrait session at 702-330-5838 or send us a message. We respond back to all inquires as soon as we can.